I'm reading on the internet that ping pong and table tennis are different things and one is considered a sport and the other is not. I honestly don't know if people are just making jokes or if the distinction is that serious. Could someone explain? There is no difference. Ping pong is simply another name for table tennis. The two terms are used by the vast majority of people interchangably. 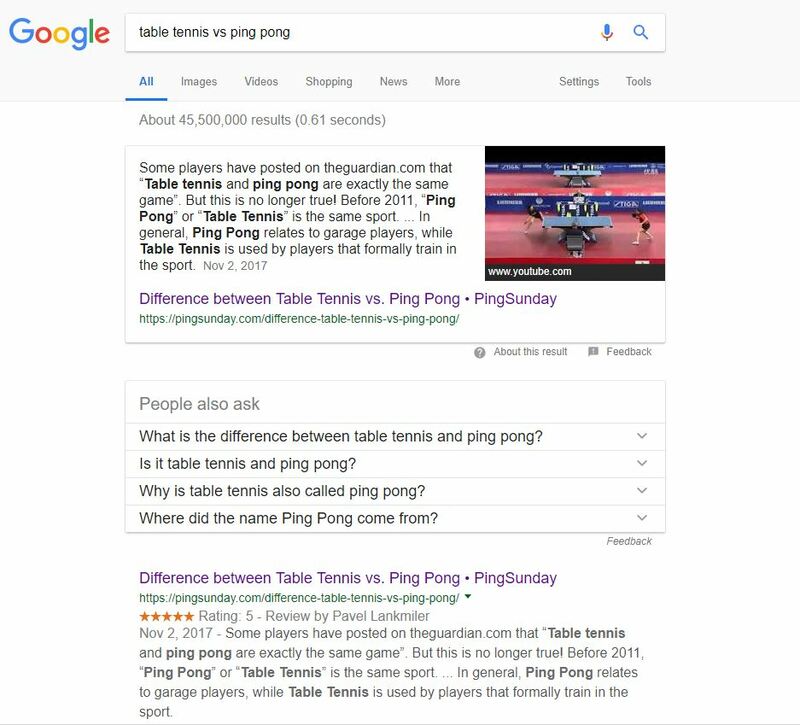 Historically, the name Ping Pong was a trademarked name owned by Jaques of London and by Parker Brothers in the U.S. Table tennis was the generic name for the sport, and is the official name as recognized by the International Table Tennis Federation (ITTF), the governing body of the sport. In practice, ping pong is now essentially a genericized trademark (although a company named Escalade Sports still claims to own the Ping Pong trademark). There are table tennis enthusiasts that do not like the name "ping pong" because they think that name doesn't sound enough like a serious sport. Up until recently, they did indeed refer to the same thing, and as noted by @BenMiller, some Table Tennis players regarded it as derogatory. However recently, Ping Pong has been somewhat rebranded by the World Championship of Ping Pong tournament. In this tournament players play with identical bats which use sandpaper on both sides. They lack the speed and spin of regular table tennis bats leading to longer and more exciting rallies. Whilst not yet hugely popular at grass roots level, the format is gaining popularity, with more tournaments and players participating every year. Ping Pong and table tennis are the different sports. Not the answer you're looking for? Browse other questions tagged terminology table-tennis or ask your own question. What is meant by a natural hat trick in hockey?